The Kona Coffee Festival recognizes the achievements of Kona’s coffee pioneers, farmers and artisans. This award-winning coffee fest is recognized as the oldest and most successful food festival in Hawaii. The festival starts Friday, November 3 and runs through Sunday, November 12, 2017. The festival includes 10 days of events honoring Kona coffees cultural heritage. A Lantern Parade. Historic Kailua Village. Nov 3, 6:00 pm – 9:00 pm. Watch as the lantern parade winds its way through Historic Kailua Village with its glowing procession of light, music and color. And finally culminating with an evening bon dance at Hale Halawai. The Holualoa Village Coffee & Art Stroll. In historic Holualoa Village. Nov 4 – 9:00 am – 3:00 pm. Stroll through the art district of quaint Holualoa Village. While strolling visit galleries exhibiting an extensive collection of local artists. Also over 30 Kona coffee farms join the festivities offering tastings and products for purchase. The Miss Kona Coffee Scholarship Pageant. Sheraton Kona Resort & Spa – Kaleiopapa Convention Center. Nov 4 – 5:30 pm. The Miss Kona Coffee Scholarship Pageant is hosted by the Kona Coffee Fest each November. A big mahalo to the scholarship sponsor – Ueshima Coffee Company, Ltd. The newly crowned winner will also travel to Japan to promote Kona, it’s special coffee and the industry. The Kona Coffee Recipe Contest & Big Island Showcase. Sheraton Kona Resort & Spa – Kaleiopapa Convention Center. Nov 5 – 10:00 am – 3:00 pm. Big Island Showcase opens at 10 a.m. Featuring Hawaii Island products, gifts, and opportunities to buy farmer-direct Kona coffee. Also amateurs, culinary students and professional chefs present their favorite sweet and savory recipes . All featuring 100% Kona Coffee. Keiki (children) showcase sweet or savory snacks. Recipe contest doors open at 11 a.m.
Cupping Competition–Preliminaries Daylight Mind Coffee Company at Waterfront Row. Nov 8 @ 8:30 am – 1:30 pm. Kona Coffee Cultural Fest Ho’olaule’a. Makaeo County Pavilion. Nov 11 – 9:00 am – 3:00 pm. A celebration of all things Kona coffee. The Festival of Arts & Crafts. Enjoy the beautiful lei contest. Participate in traditional Hawaiian poi making, ikebana and traditional Japanese calligraphy. Also visit the heritage display. Indeed, all day fun for the entire ohana (family). Kona Coffee Council Farm & Mill Tour. Leaves from Keauhou Shopping Center. Nov 7 and 10th – 9:00 am – 2:00 pm. You will visit three working coffee farms in Kona. The fee of $75 includes your transportation and a box lunch. Pick up and drop off located in front of Regal Keauhou Stadium 7 Theatres in the Keauhou Shopping Center. Reservations required; book online at www.kona-coffee-council.com. 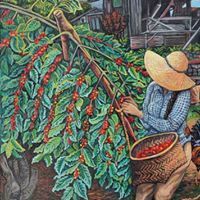 Kona Coffee Living History Farm Tour – November 3-10, 2017. Daily at 2:00 pm. $10 with festival button (available for purchase on site). Stroll through this historic farm on a self-guided tour that reveals the story of Kona’s coffee pioneers during the early 20th century. Walk among the coffee trees and meet a “Kona Nightingale”. Also discover how farmers used the kuriba and hoshidana to mill and dry Kona’s world-famous coffee. Artisan coffee roasting. What is it? Artisan coffee roasting is an art. While many roasters are now nothing more than glorified button-pushers on machines that have have pre-set roasting settings, artisan coffee roasters apply creativity and art to the roasting process. 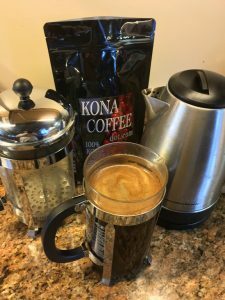 What are Kona Peaberry Coffee Beans? Peaberry is not a type of coffee tree! Occasionally people ask “If Peaberry coffee beans are so rare, why don’t you plant more peaberry coffee trees?” Unfortunately, that is not how it works. Like all 100% pure Kona coffees, peaberry beans are grown in Kona on the Big Island of Hawaii (also known as Hawaii island). In most cases, the berry, or red fruit of coffee plant, develop two halves of a bean. But in very rare instances, some berries only have one “pea” shaped bean. Peaberry beans get their name from this shape . Albeit peaberry beans are a little more oval than round. Continue reading What are Kona Peaberry Coffee Beans? Proper storage of your coffee will extend your shelf life and insure it does not get stale. Kona coffee from us comes in a resealable bag. This coffee packaging has a one way degassing valve. The valve allows the release of the natural C02 gases formed when roasting. It also keeps oxygen out. Extend the shelf life of your coffee. As with most food products exposure to air and moisture will spoil it. If you expose your coffee to air, eventually it will lose it’s true flavor. Valved coffee bags changed Kona coffee packaging significantly. Materials such as metalized films, aluminum foil laminations, high barrier packaging materials and custom blended barrier films, with degassing valves ensure your Kona coffee has a longer shelf life and stays fresh! We only use resealable zipper lock closures with gas release valves. How to seal bag for maximum shelf life. After opening your Kona coffee, we recommend you reseal the zipper lock. First squeeze the air out. Then seal the zipper lock and finally press any remaining air out through the degassing valve. Your Kona coffee will stay fresh and remain the best cup of coffee in the world! While many tourists flock to Kona to drink its coffee from its source, care must be taken to preserve its taste over time. We typically roast and package within days or a week of shipping to insure freshness. Brewing Coffee Guide – how to get the most flavor! Step by step instructions on grinding, brewing and making the perfect cup of Kona Coffee, every time! Kona coffee is a rare, expensive treat that stimulates all the senses. So why do anything less than put some effort into brewing? As you’ll see, it doesn’t take that much more time. Extra Fancy Medium Roast – medium-smooth flavor (most popular). Grinding beans is a treat all its own, with its rich, spicy aroma. Also a secret to good coffee often starts with its grind. It’s important to know what of grind works best for the flavor you’re chasing — whether its coarse, medium or fine. Generally, a good rule to follow is to use 2 tablespoons of coffee beans for every 6 to 8 ounces of water. Adjust for taste. Load your fresh beans in the top of the grinder. Once the grinder is loaded, use the grinder in short bursts a few seconds each so the coffee doesn’t overheat. Also shake the grinder as it’s grinding to get an even grind size. Burr grinders offer coffee drinkers greater precision and consistent grind size. It’s a more expensive alternative to other grinding methods, so some time needs to spent figuring out what burr grind works best for you. We recommend using filtered water for brewing. The better the water, the better the end result. Public water systems tend to add undesirable flavors. It’s not enough to bring your water to a boil. You want that water the right temperature — between 195 and 205 fahrenheit. Just below boiling. Any hotter, and you’ll run the risk of burning the grinds when you add the water. Kona Coffee steeping in a french press with nice crema. We recommend using a French press. Add 1 rounded tablespoon of ground coffee for each 4 ounces of water to the French press. Stir the coffee, allowing the grounds to interact with the hot water. Wait 3 to 5 minutes for the coffee to steep, then plunge slowly. Complete instructions for getting the most from your French press here. If you’re using a drip coffee maker or using the pour over technique, we recommend using a natural paper filter. Cloth filters can add undesirable tastes to your cup of Kona. For drip or pour over brewing use the approximately the same amount of coffee described above. Kona – The perfect growing environment for coffee. Kona is the perfect coffee growing environment in the United States and arguably, in the world. Kona combines the exacting combination of sun, soil, shade and water that coffee trees thrive in. Coffee is an extremely temperamental crop, but coffee trees take perfectly to sunny mornings cloudy, rainy and humid afternoons. Continue reading Kona – The perfect growing environment for coffee. Love coffee? 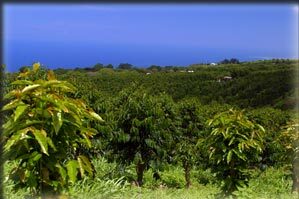 Take a Kona coffee farm tour! Visiting the Big Island of Hawaii usually means sun, surf and volcanoes — but for coffee lovers, their stay wouldn’t be complete without a Kona coffee farm tour. The Kona Coffee Council is an organization of Hawai’i farmers, processors and retailers who grow, process and sell the World’s Best coffee! In this case over 175 years of development. 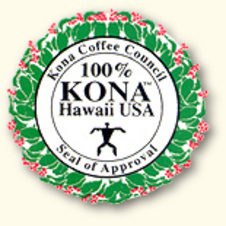 Particularly to legally be labeled Kona, the coffee beans must be grown only in the North or South Kona districts. Located on the west side of Hawai’i Island (the Big Island). These heritage trees thrive in the unique combination of sunshine, rainfall, location, and volcanic soil . In fact this combination is only available in Kona, Hawaii. The combination of these unique elements create our award-winning coffees. The main objective of the Kona Coffee Council is to protect the interests of the Kona Coffee industry. The KCC represents the interests of Kona coffee growers. Furthermore, the KCC ensures buyers are getting authentic, 100 Percent Pure Kona Coffee. 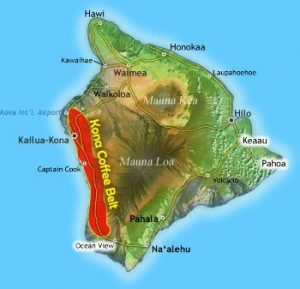 Kona Coffee Belt – Leeward side of the Big Island (also known as Hawaii Island). The Kona Coffee Belt is a strip of land running almost parallel to Kona’s famed “gold” coast. This zone, approximately 30 miles long and 2 to 3 miles wide, has proven to have ideal coffee growing conditions. Some say the best natural growing conditions in the world for coffee. This “lower humid zone” lies between approximately 700 ft and 2500 ft elevation. It begins in the north at approximately Makalei and extends south almost to Oceanview. Also, the zone includes the west slopes of both Hualalai and Mauna Loa mountains. Annual rainfall in the belt is in an ideal amount and distribution. Consequently coffee in Kona typically has not been irrigated. The winter dry season forces the coffee trees into a state of semidormancy. This period promotes flowering. Following the dry season, rainfall gradually increases as the crop matures. Then, rainfall decreases as the harvest season approaches and the fruiting cycle starts as the winter dry period begins. The last of the beans are harvested during the low rainfall in December-February. Rainfall increases rapidly after mid-April in the coffee belt. Higher temperatures and high humidity provide the elements for rapid progression of the present crop. Decreasing rainfall in mid-September promotes harvest of the ripe cherries. In the heart of the Kona coffee belt lies CTAHR’s Kona Research station. This station records the annual average temperature is 69°F, the average minimum is 60°F, and the average maximum is 78°F. Simultaneously with drought, seasonal temperatures drop. Thus causing the coffee trees to slow their growth and develop flower buds. Kona Research Station temperatures for December, January and February average 67°F (57°F minimum, 77°F maximum). Interesting Note: Previous to 1983, the annual rainfall averaged 68 inches. Although since 1983 when Kilauea began erupting, it has been drier, averaging only 49 inches. Grading by bean size and amount of defects. The dry mill grades the green coffee beans according to size and number of defects in a given batch. Fancy or Kona #1 beans make up about 75 percent of the harvest. These are the beans most coffee drinkers are grinding when they’re making their cup. Extra Fancy beans make up about 20 percent of a farm’s crop. They are heavier and larger. They are the biggest in size and will have the least amount of defects. Peaberry is the rarest of the beans, typically accounting for 3-5% of the total crop. They are genetic anomalies. Normally, two coffee beans are in a berry. However, in the case of peaberry, there’s just one bean. Regular coffee beans are also flat on one side and round on the other, but peaberries look like almost like little footballs. They have a lower acidity and because of their shape, they roast differently and have a slightly different taste. Connoisseurs say they are the smoothest of all and have more of a chocolaty flavor than the other Kona beans . Also, you might hear the term Estate Grown. Estate means all the beans are all from the same farm. Estate is usually not graded so it may contain a mix of all grades of Kona. No matter what kind of bean you choose to drink, make it 100 Percent Pure Kona Coffee. Its balanced flavor, low acidity and world renowned quality is unparalleled.